The Beacon of Light Program is a benefit walk conducted every year to raise awareness of lung diseases. Walkers from across the Central PA region join together to raise money to help local Lung Cancer patients with their medical expenses. The seventh annual Beacon of Light on Lung Cancer Benefit Walk, held on Friday, August 17, 2018 inside the Logan Valley Mall as part of Health-O-Rama, raised $740 with additional donations still being received on the Lung Disease Foundation of Central PA’s website.. Walkers from across the Central Pennsylvania region joined the physicians, staff, and volunteers of the Lung Disease Foundation of Central Pennsylvania to raise money to help local Lung Cancer patients with their medical expenses. Barbara Gerrity raised $440 making her the walker who raised the most donations for the third consecutive year. Olivia Balderas, Montanna Pigza and Megan Carvaugh tied as the winners of the most laps walked. 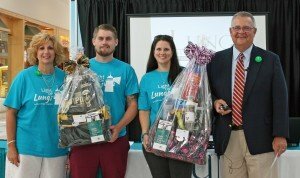 The winners received gift baskets from Select Specialty Hospitals valued at over $100 each. The Lung Disease Foundation of Central PA, a 501(c) (3) nonprofit foundation founded by Dr. George M. Zlupko, is located at the Lung Disease Center of Central PA, 800 Chestnut Avenue, Altoona, PA along with the Altoona Lung Specialists and the Sleep Disorder Network. For more information on the walk and the Foundation, please contact Sherri Stayer, Executive Director, at 814-946-2845, ext. 200 or email her at sherris@altoonalungspecialists.com. 2017 BEACON OF LIGHT ON LUNG CANCER BENEFIT WALK SUCCESSFUL! 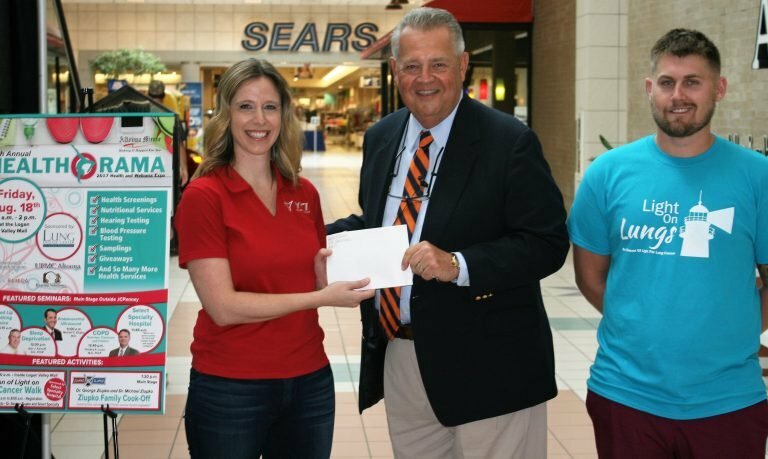 The sixth annual Beacon of Light on Lung Cancer Benefit Walk, held on Friday, August 18, 2017 inside the Logan Valley Mall as part of Health-O-Rama, raised $1,603. Walkers from across the Central Pennsylvania region joined the physicians, staff, and volunteers of the Lung Disease Foundation of Central Pennsylvania to raise money to help local Lung Cancer patients with their medical expenses. Photo Caption: (left to right) Connie Miller of Select Specialty Hospitals, sponsor of the Beacon of Light on Lung Cancer Benefit Walk; Michael Harf, walker recognized for the most laps walked; Barbara Gerrity was the winner of the most donations raised; Dr. George M. Zlupko, Chairman of the Lung Disease on Foundation of Central PA.
Students of YTI Career Institute – Altoona participated in the Benefit Walk for the 6th year in support of the Lung Disease Center. In addition to walking at the event, the school had a nacho day that raised money for the walk and had two different “Jeans Days” where the students could wear jeans and donate a dollar toward the Benefit Walk. “Being a school in Allied Health and having a Respiratory Therapy Program, it just makes sense that we support the Lung Disease Center,” stated Natalie Lombardo-Beaver, YTI Campus President. “The Lung Disease Center doctors provide a great benefit locally to the community and we want to show our support to them. The center has supported our students in the way of lectures, graduation speeches, externships and employment opportunities for several of our Allied Health Programs,” shared Lombardo-Beaver. YTI students enrolled in the Respiratory Therapy Program listened to the Lung Disease Center doctors speak during Health-O-Rama following the walk on subjects relating to their field of study. “This is a great opportunity for the students to network with the local medical facilities and providers at the Health-O- Rama. I would say this is something that YTI will continue to be a part of in the years to come”, stated Lombardo-Beaver. Natalie Lombardo-Beaver, YTI Altoona Campus President (far left) and Mike Harf, YTI Respiratory Therapy Student (far right) present Dr. George M. Zlupko, Chairman of the Lung Disease Foundation of Central PA, a check in the amount of $150 representing donations raised by YTI students enrolled in their Reparatory Therapy Program. Barbara Gerrity raised $520 making her the walker who raised the most donations. Ashley and Josh Snyder were tied as the winners of the most laps walked. The winners received gift baskets from Select Specialty Hospitals valued at over $100 each. “I was happy to see the growing number of people come out for the walk and their enthusiasm to support this important cause. Every year the walk has generated donations to help lung cancer patients of the Lung Disease Center to cover their medical expenses and it is greatly appreciated,” shared Zlupko. Dr. George M. Zlupko, Chairman of the Lung Disease Foundation of Central Pa (far left) and Kelly Blake, CEO of Select Specialty Hospital (far right), present Ashley and Josh Snyder their prize for walking the most laps at the 2017 Beacon of Light on Lung Cancer Benefit Walk. 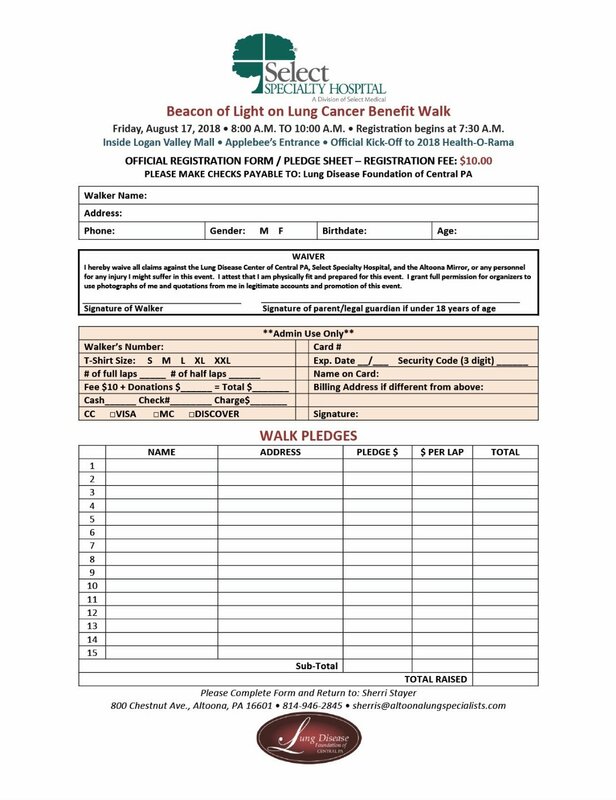 The Lung Disease Foundation of Central Pennsylvania announces the Sixth Annual Beacon of Light on Lung Cancer Benefit Walk, to be held Friday, August 18 from 8am to 10am inside the Logan Valley Mall. Each year, walkers from across Central Pennsylvania join the physicians, staff, and volunteers of the Lung Disease Foundation of Central Pennsylvania to raise money to help local lung cancer patients with their medical expenses. Lung cancer takes the lives of nearly 160,000 Americans annually. Lung cancer accounts for twenty-seven percent of all cancer deaths in the United States, more than deaths from breast cancer, prostate cancer, and colon cancer combined. Yet lung cancer research receives significantly fewer funds per death than other common types of cancer. By shining a beacon of light on lung cancer, the Lung Disease Foundation of Central Pennsylvania works to promote early detection of lung cancer, educate the public about lung cancer, and empower lung cancer patients to get the treatments they need. 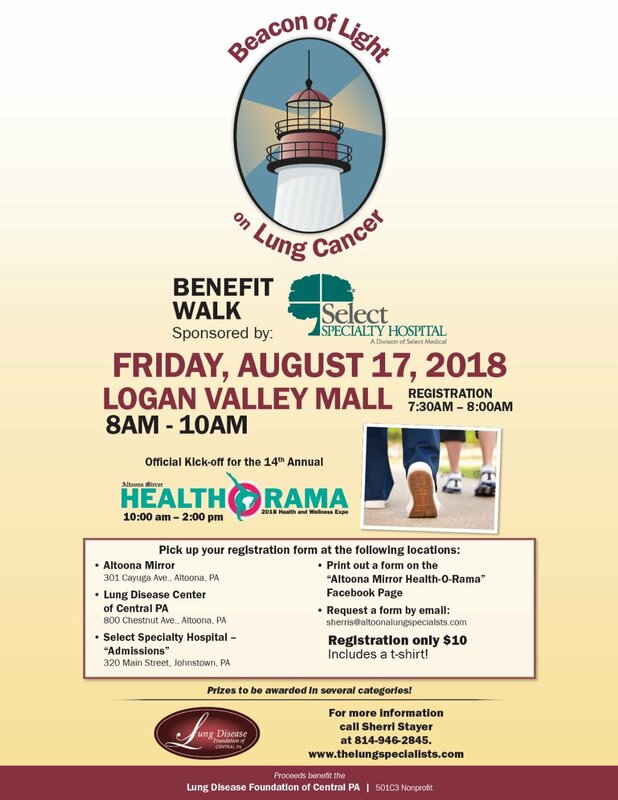 The Beacon of Light on Lung Cancer Benefit Walk is sponsored by Select Specialty Hospitals of Johnstown, who will award prizes to the walker who completes the most laps and the walker who raises the most funds. The event kicks off Health-O-Rama, an annual health and wellness expo sponsored by the Lung Disease Center of Central Pennsylvania and presented by the Altoona Mirror. Registration is only $10 per person, and all walkers will receive a free Light on Lungs t-shirt. Registration forms are available at the Lung Disease Center, regional businesses, and lungdiseasefoundation.org. The Lung Disease Foundation of Central Pennsylvania is a 501c(3) nonprofit organization founded by Dr. George M. Zlupko in 2013. The foundation is located at the Lung Disease Center of Central PA, 800 Chestnut Avenue, Altoona, PA along with the Altoona Lung Specialists and the Sleep Disorder Network. Their mission is to inform, empower, and educate individuals on how to improve all aspects of lung health. For more information, visit www.lungdiseasefoundation.org or contact Sherri Stayer, Executive Director, at 814-946-2845, ext. 200 or at sherris@altoonlungspecialists.com. Click here Health-O-Rama Walk Sponsorhsip 2017 to download your walk form. 2017 Beacon of Light on Lung Cancer Benefit Walk! 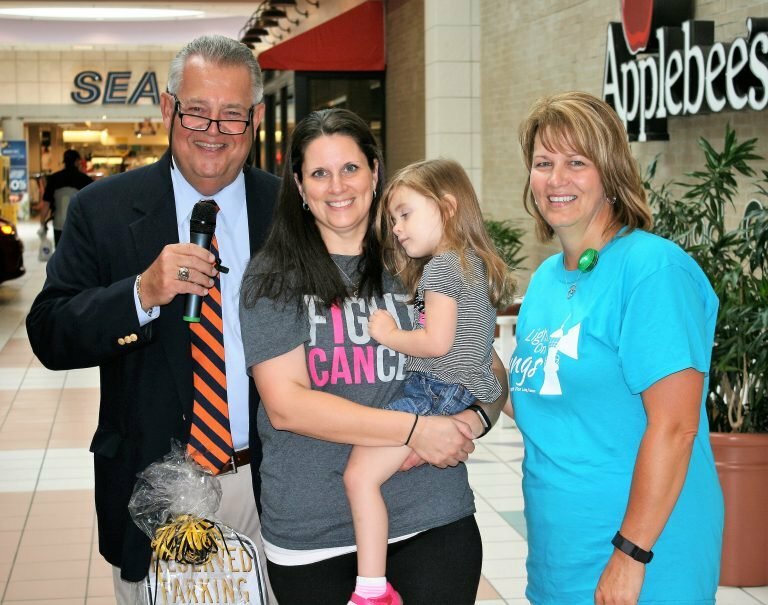 The fifth annual Beacon of Light on Lung Cancer Benefit Walk, held on Friday, August 19, 2016 inside the Logan Valley Mall, was a great success with both the number of walkers and funds raised surpassing last year’s walk. A total of $2,847.25 was raised through donations raised by the 60 walkers and additional donations contributed following the walk during Health-O-Rama. Dr. George M. Zlupko, Chairman of the Lung Disease Foundation of Central Pa (far left) and Kelly Blake, CEO of Select Specialty Hospital (far right), present Barbara Gerrity her prize for being the walker who raised the most donations for the 2017 Beacon of Light on Lung Cancer Benefit Walk. Barbara Gerrity raised $1,565 making her the walker who raised the most donations. Michael Harf was the winner of the most laps walked. Both received gift baskets from Select Specialty Hospitals valued at over $100. Paul Figart and Cathy Vaught, who also participated in the walk, each received a case of Roaring Spring Water. Dr. George M. Zlupko, Chairman of the Lung Disease Foundation of Central Pennsylvania shared “I was impressed and happy to see how many people came out for the walk and how enthusiastic they were to support this important cause. I’ve never seen so many people look good in t-shirts! The Light on Lungs artwork on the t-shirts really did light up the mall,” shared Zlupko. Every year walkers from across the Central Pennsylvania region join the physicians, staff and volunteers of the Lung Disease Foundation of Central Pennsylvania to raise money to help local Lung Cancer patients with their medical expenses. Over 158,000 Americans died from Lung Cancer in 2015 and many others suffer from this terrible disease. The Lung Disease Foundation is committed to making a positive difference in fighting Lung Cancer through their Lung Cancer Early Detection Program and funds raised through events including the Beacon of Light on Lung Cancer Benefit Walk. The Lung Disease Foundation of Central PA, a 501(c) (3) nonprofit foundation founded by Dr. George M. Zlupko, is located at the Lung Disease Center of Central PA, 800 Chestnut Avenue, Altoona, PA along with the Altoona Lung Specialists and the Sleep Disorder Network. For more information on the walk, the Foundation, please contact Sherri Stayer, Executive Director, at 814-946-2845, ext. 200 or email her at sherris@altoonalungspecialists.com.